When Pete was a very little Ricepudding, he began with football. His uncle Joseph was his trainer. This uncle Joseph had a bald head and a long white beard. He had a book about football that explained the whole game in detail. Every sunday they played football in the parc. Most of the time, uncle Joseph said that Pete played football rather well, but sometimes he said that Pete played 'rubbish like a swab'. One day, Pete was already seven years old, uncle Joseph said that Pete could now join a football-club. They went to the soccer-club RKVCL, and Joseph introduced Pete to the trainer with the words: "This boy can play football rather well, make that he becomes a good player". Pete could join 'pupils 7', and he played in the team almost every week. But it happened rather often that he didn't hit the ball. When he grew up, Pete scored a goal sometimes, but it happened at other times that he scored by accident for the opponent. Sometimes an opponent ran him down, but Pete himself could nudge one too. He got the nickname 'the bones-kicker'. One time he had to take the place of another fellow of his own team, three minutes before the end of the game, and he scored a goal by accident because he stumbled over his own legs, and hit the ball with his head. Then he got a congratulation from the trainer. Uncle Joseph went rather often to the flee market in the MECC congress-hall. One day he found there a pair of shining football-shoes (they had just been polished of course), and he bought these shoes for Pete. The boy needed the new shoes, for he could only put on the old ones by using a lot of string. The new shoes fitted and walked well, although they were a bit large. Pete had a feeling that he could play better football by wearing the shoes. A few weeks later on, Pete Ricepudding scored three goals in one match, and fortunately there was a Ajax scout watching. 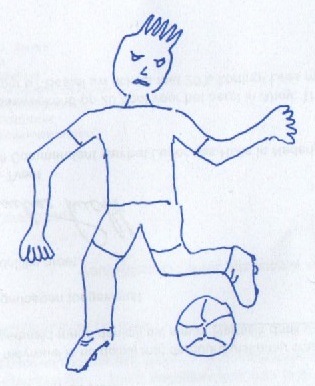 The scout thought that the boy with the rigid hair was a good footballer. "He could become a Jaap Stam, or else a Van Vossen", he said. He asked Pete if he would come to play for Ajax. Pete said goodbye to his uncle Joseph. The old man wished him good luck. Pete went to Amsterdam to live with his uncle Archie. This was a fat man who wore a little peruke. Pete stayed no longer than three weeks in the Ajax junior team. He scored seven goals for the team, and people began mumbling "my goodness!" and "he plays like Cruijff!". He trained now with the great Ajax 1 team, and the cracks Gronkjaer and Arveladze were his friends. One fine autumn day, Pete stood in Ajax 1 to play a whole match. It was an INTER-cup match against FC Sao Paulo from Brasil. This was very important to Pete, because there was a scout from Lazio Roma on the tribune, and uncle Joseph could use a supplement over and above his benefit for elderly people. It was a pity that the football-shoes that uncle Joseph had given to Pete were worn in holes. He got a new pair from ADIDAS. As soon as the match began, Pete knew that his play was 'rubbish' with these new shoes. He could not hit the ball, and suddenly he scored for the opponent, surprising the goalkeeper of his own team by touching the ball with the back side of the head. After twelve minutes, his fellow Aron Winter passed the ball to Pete. Pete got the ball right before his feet, standing in front of the empty goal of the opponent, but the ball was kicked badly and flew over the side-line. The spectators yelled "BOOO Ricepudding, bungler!" and "Ricepudding go home!". The trainer called that Pete must leave the field. After that, Pete was never again a football-star. He can be brilliant yet, playing sometimes for RKVCL. But only if he puts on the shoes, worn to holes, that uncle Joseph had given to him.